Freddie Gray case proves the limits of prosecution in police reform. 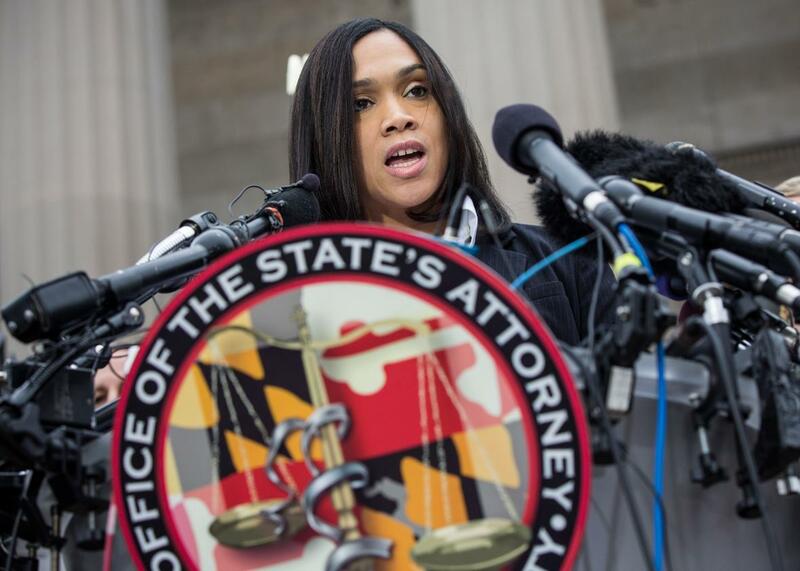 Baltimore State’s Attorney Marilyn J. Mosby announces that criminal charges will be filed against police officers in the death of Freddie Gray on May 1, 2015, in Baltimore. In a press conference Thursday morning, the two lead prosecutors on the Freddie Gray case, Michael Schatzow and Janice Bledsoe, spoke publicly for the first time about their efforts to convict six Baltimore police officers in connection with Gray’s death. Their comments came one day after Baltimore State’s Attorney Marilyn Mosby dropped all charges against the officers, concluding that her office had no chance of achieving a successful prosecution in any of the upcoming trials. Most of the questions Schatzow and Bledsoe addressed were about the particulars of their investigation, and what Mosby on Wednesday had called a deliberate effort on the part of the Baltimore Police Department to thwart the prosecution. But just before the press conference concluded, Schatzow took a question that went to the heart of why so many people around the country—including Black Lives Matter activists and law enforcement loyalists—are feeling as though the year-long legal process that ended Wednesday has been a failure. Schatzow’s answer began with a statement implying that the police officers who interacted with Gray before his death had not been completely honest: “We can’t know what happened to Freddie Gray unless the people involved tell us what happened to Freddie Gray.” While those people had told the prosecutors “some things,” Schatzow said—maybe even “everything they know”—it was not enough to establish a definitive narrative. But Schatzow rightly took the reporter’s question to be about more than the facts of the case—that what she really wanted him to talk about was why the criminal justice system had failed to bring about the kind of closure that people tend to look for in trials, and who was responsible for that failure. A trial is not about answering broad questions. A trial is focused on whether the state can prove beyond a reasonable doubt the guilt of the defendant who is charged. A trial may not be the best vehicle to determine broad questions of public policy; broad questions of what the law should be; broad questions, in this case, of how the police should police; or how citizens should interact with the police. A criminal trial may not be the best place to do that. This reply could be seen as a deflection, and maybe it is. But it also gets at a frustrating truth about how acts of fatal police misconduct have tended to be processed and discussed in press coverage and social media over the past several years. Too often, it seems like the first and last question we ask when we hear about cases like that of Freddie Gray, Tamir Rice, Michael Brown, and Akai Gurley is whether the officer responsible for causing the victim’s death will be charged with a crime and sent to prison. On one hand this makes sense: One of the foundational arguments behind the movement for police reform is that police officers should be held to the same standards as the rest of us and that when they commit crimes, they should be vigorously prosecuted. The fact that police officers almost never face criminal sanctions when they kill people is proof that the system is rigged, and that the lives being lost matter less in the eyes of the law than a desire to protect cops from consequences. It’s natural, in other words, to be focused on the issue of punishment when it seems like a police officer has done something wrong. But what the tortured prosecution of the Freddie Gray cops proves—and Schatzow’s comments underscore—is that the justice system alone cannot bear the burden of advancing the cause of police reform. As intuitive as it feels to look to the courts to establish the difference between good law enforcement and bad, the fact that every case is tried on its own merits—and cannot justly be decided with an eye toward the broader social implications of the outcome—means that police prosecutions should not be freighted with all the expectations we often bring to them. Put another way, the systemic problem of violent, careless behavior by police officers cannot be addressed merely by charging individual cops with crimes, even if, in some cases, justice demands it. Critics of Marilyn Mosby, Schatzow’s boss, have accused her of rushing to charge the six officers in the Freddie Gray case in order to send a political message—that the spirit driving her to indict was more about a general belief about holding police responsible for misconduct than it was about the actions of these particular officers. Schatzow’s comments at Thursday’s press conference were an implicit rejection of that diagnosis—an assurance that he and his team never saw their duty in these cases as being about advancing a social justice agenda, or a matter of providing satisfaction to people who hold certain beliefs about American law enforcement. There are those who would say that advancing a social justice agenda is exactly what a prosecutor is paid to do, one case at a time. But the point of Schatzow’s remarks Thursday was that trials are not designed to be used as vehicles for activism or reform, and courtrooms should not be seen as the primary arena in which our society deals with the crisis in policing. No, there is nothing wrong or naïve about wanting bad police officers to answer for their misdeeds. But to allow the debate around curbing misconduct to become completely focused on putting cops behind bars risks entrusting the imperative for change to a system that is ill-equipped to deliver on it.